District 9, written and directed by South African expat, Neill Blomkamp, has topped the box office in the US with a whopping US$ 37 million ticket sales in the first weekend. The movie cost approximately US$ 30 million to make and the way things are going it will surely top US$ 100 million after the world wide release. Critics say it is the best movie of the year and maybe one of the best sci-fi movies of all time. The South African actor Sharlto Copley that plays the lead in the movie, has been praised with one of the best acting performances of the year. Before the opening of the movie, there was fears that a two hour movie filled with South African accents, which played of in Johannesburg, will be a little too much for American audiences. There are already talks of a possible sequel as well as a possible Oscar for special effects. What makes the good box office earnings so special is that the movie is rated R, which effectively keeps out kids. Family films traditionally earn on average much more at the box office. Well done guys! Also a great thanks to Sony pictures that took the risk on the unknown South African cast and director to make this movie. Sometimes good movies just come out of the blue. I'll make sure to watch this one. Am really happy we have scored with this one! Have linked your site to my latest post, hope that's ok? 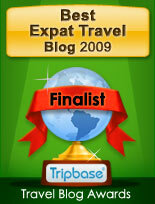 Hopefully get some more expats checking out your great blog! !